February 14th, 2018 is a day none of us will forget, but most especially the students of Marjory Stoneman Douglas High School in Parkland, Florida. On Valentine’s Day last year, a gunman opened fire at the school, killing 17 students and teachers. The mass shooting sparked a student-led movement against gun violence, which saw survivor-activists give speeches to audiences of thousands and grace the covers of magazines. Notably, many of those young activists were students of Melody Herzfeld, the drama teacher at Stoneman Douglas who was in the midst of rehearsing a year-end show with her class when the shooting began. Herzfeld and the 65 students she kept safe in a locked closet during the shooting—students you might recognize from their epic performance of “Seasons of Love” from Rent during the Tony Awards last year—are the focus of Song of Parkland, a new 30-minute documentary from HBO airing tonight, February 7th, at 7 p.m. The film tells the story of the students’ journey from rehearsals for Vikings, their year-end children’s show, through the tragedy, and ultimately onto the stage at their school where they performed in May—because, as they say, the show must go on. A poetic and heartfelt look at one slice of life post-tragedy, Song of Parkland shows the resilience of youth and the power of art and self-expression. 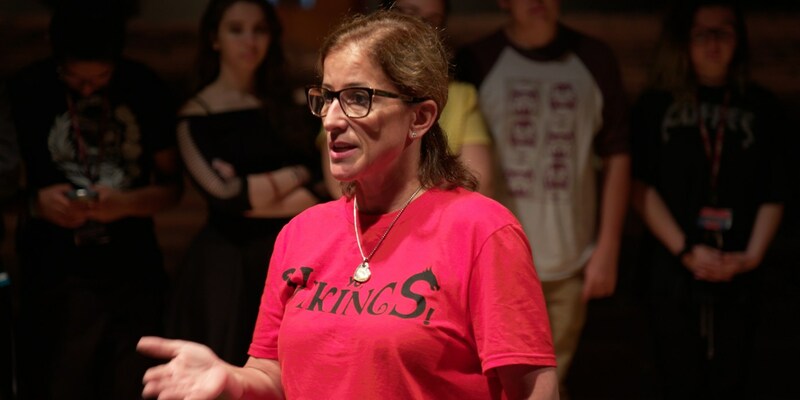 We spoke with filmmaker Amy Schatz and Herzfeld—who won the Tony award for Excellence in Theatre Education in 2018—about the students’ courage after experiencing such a tragedy. HelloGiggles: The film is so beautiful, and I was really struck by how the students were so full of energy and passion after going through such a traumatic event. Could you both speak to what you’ve learned from the students, what it was like to make this film in the wake of this tragedy, and what their spirit of joy was like? Amy Schatz: For me, it was a mix of everything. It was a mix of tragedy, sadness, grief, joy, laughter, music. It was a mix of what it means to be young and to have gone through something horrible. In telling the story, we tried to reflect back what we got from the kids, which is their commitment to doing the performance, their talent, and their love of performing. But then also the sensitive side, which is that they were all coping with tremendous grief. I think that the tricky thing in making a film is that you have to have both. You can’t just have a performance piece that’s full of happiness without knowing where they came from and why it’s so courageous to be able to perform despite that sadness. Melody Herzfeld: I think what people might take from it is that there’s a reality. The reality is that their lives are very important and they’re young, and when you’re young, two days is a week, a week is a month, a month is an eternity because you feel so indestructible. You can do anything. And this [shooting] just brought everything to a screeching halt. Seeing them be [joyful] in the wake of something so tragic is almost bizarre in a sense. That’s why I think people can’t believe the kids are actually able to get through all this. [People wonder,] How are they so happy? How are they so resilient? It’s just a reality—that’s what youth can do to you. You have it in you—it makes you want to go on. HelloGiggles: Melody, why was it important for you to be able to share this story? MH: I probably wouldn’t have shared it with anybody else, only because Amy’s background was in making films about children for children, and if it wasn’t going to be anything positive it was nothing that was interesting to me. We all were very skeptical about letting anybody into our world and what was happening, but…I felt that the fact that so many of the March for Our Lives kids were involved in theater and were my students, [the public] needed to see this delicate side of what makes them so strong. HelloGiggles: What do you mean by “the delicate side”? MH: We see on TV kids fighting and resisting and yelling and crying and screaming. There’s almost this violent attitude of trying to speak up loud enough, and if you yell loud enough, someone’s going to listen to you. But there’s also this delicate side—the part that [allows you] to communicate something important, and that’s what you can get in theater. How can you communicate something and adjust the volume, in a sense, and still send the same message? HelloGiggles: Can you describe the opening night of the show? What do you remember most from that night? MH: What’s funny is you always have expectations. The kids are about to go on and perform and the parents are like, “Are you nervous? Are you nervous?” and I’m like, “I’m not nervous anymore, it’s their show.” Because once I’ve done my directing, my production stage manager is in charge of everything. I sit in the audience and I get to watch as an audience member, I’m not backstage. I try to really teach my kids what the real world is like—I want my program to be student-driven, so they drive all the directorial positions in the plays that we do. So once I’m finished doing my work and making sure they’ve got what they need to create a beautiful performance, that’s it. It’s done. And I tend to other things, like the front-of-house, or seating guests. But that night was really special because the whole community came back. We had a really full house and there was that anticipation of something special about to happen. It was almost like it was opening night for forever.